The budget for the Morrison government’s pet energy project – Snowy Hydro’s 2000-megawatt Snowy 2.0 expansion – has increased to more than $5 billion, more than double the $2 billion price touted when former prime minister Malcolm Turnbull announced the ambitious mega project two years ago. The timeline has doubled from the original four years to eight years, which means the pumped hydro project – which Snowy and the government say is the best solution to the grid congestion and instability caused by the rapid growth of wind and solar energy – won’t be operating at full capacity until 2026, assuming it gets a start this year. The new figures – contained in separate announcements last week by Salini Impregilo, the Milan-based lead engineering contractor for the project, and its co-lead contractor, Australian engineering firm Clough – were first reported by Reneweconomy. 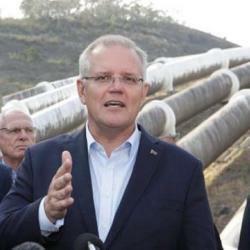 The blowout comes as Prime Minister Scott Morrison and Energy Minister Angus Taylor seek to incite a new round of energy and climate policy wars ahead of a federal election expected to be called any day. Labor leader Bill Shorten backed the project as a “good idea on paper” in February but described it as a “battery with no plug, because they won’t back in renewable energy”. The government says Labor’s 50 per cent renewable energy target by 2030 is economically reckless and has no renewable energy target of its own beyond the federal renewable energy target’s 23-24 per cent target for 2030, which will be passed within a year or two. Renewable energy made up 21 per cent of generation in the National Energy Market last year. Snowy said via a spokesman that the new contract figures were not inconsistent with the previously announced figures on the project and included contingencies and all future CPI increases for labour, construction and materials. In documents released in February, when Mr Morrison announced a $1.4 billion equity injection into Snowy Hydro to fund Snowy 2.0, the federal government-owned hydro power giant said the costs of the project were still “in line” with the range of $3.8 billion to $4.5 billion revealed with selected highlights of the initial feasibility study in December 2017. The spokesman said the government-owned company had decided to stick with the $4.5 billion figure in “real” 2017 dollars to avoid confusion and the $5.1 billion figure cited by Salini Impregilo was a contractual amount. “Snowy Hydro no longer has any CPI risk,” he said. He said there was no cost blowout and the management had not had to go back to the board to secure a further investment approval. Clough’s announcement said it had signed a contract for eight years but the Snowy spokesman said this included a defects and liability period of two years after commissioning of the six 330MW Snowy 2.0 units is completed. The spokesman said the company still expected to commission the unit by early 2025, and the last of the eight units by late 2025, suggesting the full 2000MW capacity will not be on line until early 2026.